The Cuisinart CCC-100 is a charcoal chimney starter. 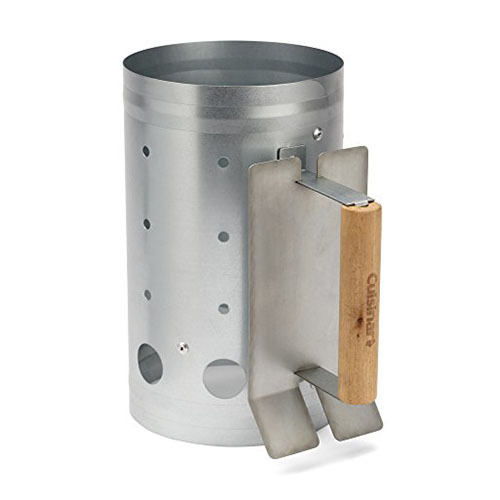 It allows to safely and conveniently light charcoal for a grill or smoker. Just crumple up some old newspaper & stick it in the space below the metal divider in the charcoal chimney & place the chimney on a charcoal grate on a grill or smoker. Use a lighter to light the newspaper through the large vent holes. Wait 10-20 min until most of the briquettes are partially covered in white ash & then your charcoal is ready to go. The Cuisinart Charcoal Chimney Starter has many exciting features for users of all types. You can extend the lifetime of your Cuisinart Charcoal Chimney Starter with the purchase of a FactoryOutletStore Factory Protection Plan. See the Cuisinart Charcoal Chimney Starter gallery images above for more product views. The Cuisinart Charcoal Chimney Starter is sold as a Brand New Unopened Item.